Atomy's first GSGS health functional supplement was recently launched in Japan. Following its first GSGS launch of pelvic support stockings, Atomy Japan has just released its second GSGS item, Atomy Premium Lutein 30, aiming at leading the Japanese lutein market through Atomy’s core value of Absolute Quality Absolute Price. Atomy Japan believes that these GSGS initiatives will contribute to Atomy Global’s goal of becoming a global distribution hub. After it successfully launched its first GSGS product(pelvic support stockings), Atomy Japan has set off with determination to focus on the eye care supplement market. As the country is on the road to becoming a super-aged society by 2030, there has been high interest in preventative vision care recently, especially for those with certain lifestyle diseases and habits (i.e. NOT taking enough green and yellow vegetables that are good for the eyes). Moreover, people generally prefer taking something simple rather than eating regular meals. Thus, the sales of eye care health supplements are steadily rising from 47.2 billion yen in 2014 to 53 billion yen in 2016. The greatest feature of Atomy Premium Lutein 30 is that it is a 100% plant-based supplement. Lutein is contained in a soft plant-based capsule that is known to be gentle on the stomach and has a high absorption rate and bioavailability. These “odorless” capsules made with corn and seaweed extract are easy to take and preferred by vegetarians or people with gelatin allergies. They are also highly heat-resistant and thus, stay stable at high temperatures. Atomy Premium Lutein 30 is also designed with “Preventing Collapse Delay” technology, which is an innovative capsule technology. In order for health functional supplements to work effectively, it must be broken down in the digestive tract (dissolved) and absorbed in the intestines. The technology to prevent delayed collapse of plant-based capsules is an innovative patented design that helps the capsules collapse rapidly after ingestion so that the contents can be digested and absorbed quickly. This is expected to enhance its bioavailability and increase satisfaction levels for consumers. The size of the capsules is also designed to be more suitable for Asian consumers. Capsule sizes have traditionally been large with Westerners being the target for health supplements. The large capsules are generally difficult to swallow and even digest for Asian consumers. So Atomy Japan has decreased the size of its Premium Lutein 30 capsule to only one third the size of a regular lutein capsule while increasing the amount of lutein contained within. This shows just how much Atomy Japan keeps its consumers’ needs at the forefront of its detailed product planning, and it is evident that this philosophy permeates throughout all Atomy overseas branches. Atomy has been steadily releasing new GSGS products beginning with the launch of Atomy Taiwan’s sandwich seaweed paper and aroma pain-relief patches in the Singapore market in August 2016. This year, Atomy Korea is sourcing and selling Japanese pelvic support stockings and Cambodian Kampot black pepper, while Atomy U.S.A. has also launched Himalayan pink salt and chia seeds for its own local market. GSGS is the strategy by which Atomy advances into global markets to realize its ultimate goal of customer success. 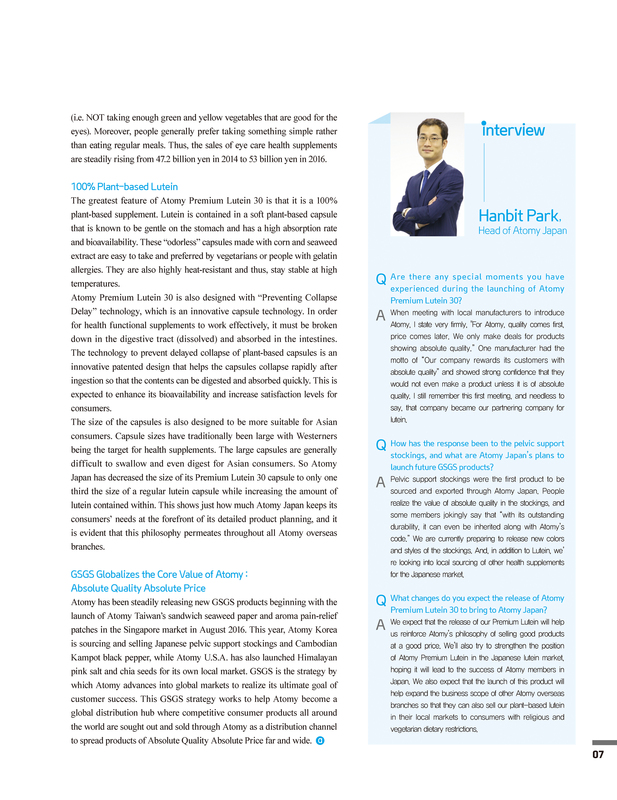 This GSGS strategy works to help Atomy become a global distribution hub where competitive consumer products all around the world are sought out and sold through Atomy as a distribution channel to spread products of Absolute Quality Absolute Price far and wide. Q. Are there any special moments you have experienced during the launching of Atomy Premium Lutein 30? A. When meeting with local manufacturers to introduce Atomy, I state very firmly, "For Atomy, quality comes first, price comes later. We only make deals for products showing absolute quality.” One manufacturer had the motto of “Our company rewards its customers with absolute quality” and showed strong confidence that they would not even make a product unless it is of absolute quality. I still remember this first meeting, and needless to say, that company became our partnering company for lutein. Q. How has the response been to the pelvic support stockings, and what are Atomy Japan’s plans to launch future GSGS products? A. Pelvic support stockings were the first product to be sourced and exported through Atomy Japan. People realize the value of absolute quality in the stockings, and some members jokingly say that “with its outstanding durability, it can even be inherited along with Atomy’s code.” We are currently preparing to release new colors and styles of the stockings. And, in addition to Lutein, we’re looking into local sourcing of other health supplements for the Japanese market. Q. 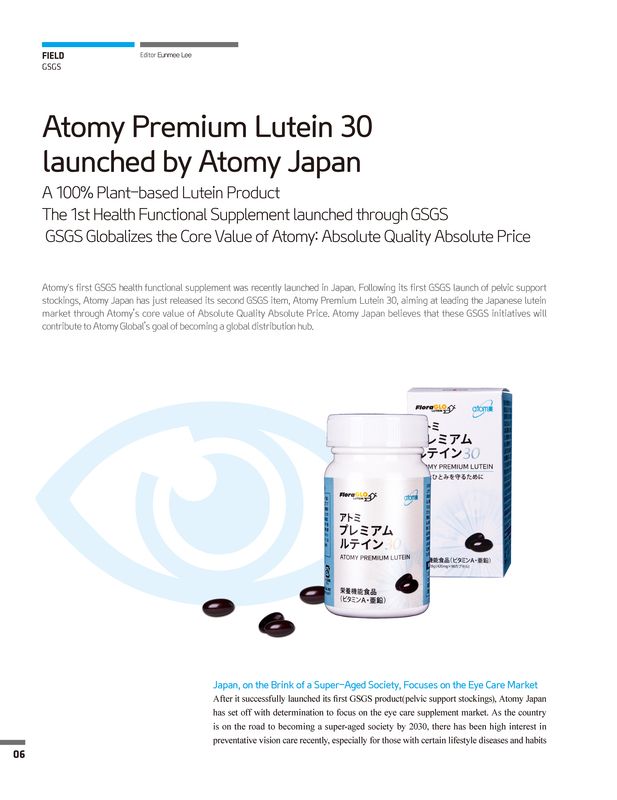 What changes do you expect the release of Atomy Premium Lutein 30 to bring to Atomy Japan? A. We expect that the release of our Premium Lutein will help us reinforce Atomy’s philosophy of selling good products at a good price. We’ll also try to strengthen the position of Atomy Premium Lutein in the Japanese lutein market, hoping it will lead to the success of Atomy members in Japan. We also expect that the launch of this product will help expand the business scope of other Atomy overseas branches so that they can also sell our plant-based lutein in their local markets to consumers.